If I’m going to say that atheism is a worldview, I better start defining terms before I find myself on the wrong side of my own issue. So, the first part of this post will be defining “atheism” and “worldview.” Once I do that, I’m going to give an analogous depiction of life incorporating the definitions and then draw a conclusion to affirm the title. Atheism. Two distinct definitions come to mind. The first is the literal definition based on the original Greek. ‘a’, meaning ‘no’ and ‘theos’, meaning ‘god’. In the strictest sense, atheism literally means no-god. But, literal translations don’t always carry over to current word usage. The word “joystick” for example, hardly means rejoice peg. The second definition is more popular with a lot of atheists at the moment, and that is: a disbelief in god or gods. I’ve written a lot on why I think these two definitions are the same (here and here). Nate has also discussed this here and here, and there are some great external links for good measure here and here). Since a lot of ground has already been covered on the second definition, I’m going to move on. Worldview. Until about 6 months ago, I didn’t really think this word needed a definition; it’s pretty straightforward, actually. The word “worldview” is simply a view of the world. But, in good faith, we will grab a more accurate definition for our friends at Google: “a particular philosophy of life or conception of the world.” This definition actually works to my advantage, but we’ll get to that. As a quick recap, atheism is either a belief in no god or a non-belief in god (because these are not the same?? I digress) and worldview is the perception of reality as it pertains to origins of the world. Can we agree to these two points? Leave some feedback below. Now, an analogous incorporation of these two terms. Life is often compared to a maze. Marriage and Family Therapist and contributor to Huffington Post, once wrote to the point, “In review, we see we have taken wrong turns, hit dead ends, lost time, meandered in wrong directions and twisted and turned at unexpected places. We thought we were going one way and had to head another. We are born into this maze”. [i] Deveric’s post goes on to describe the purpose of life and how to navigate the labyrinth. She goes on to write that the maze is navigated by perceptions and expectations, comfort and belonging, and other mental constructs. But, she writes, “No location within the maze can be the end goal because time will forcibly move you and death will take you out.” With this in mind, let’s examine worldview like a maze—an ever changing perspective but steadily moving. You wake up in the morning in the middle of a maze. In front of you is a backpack which is stuffed full of all the knowledge you’ve acquired from the previous days. You have a choice to make. 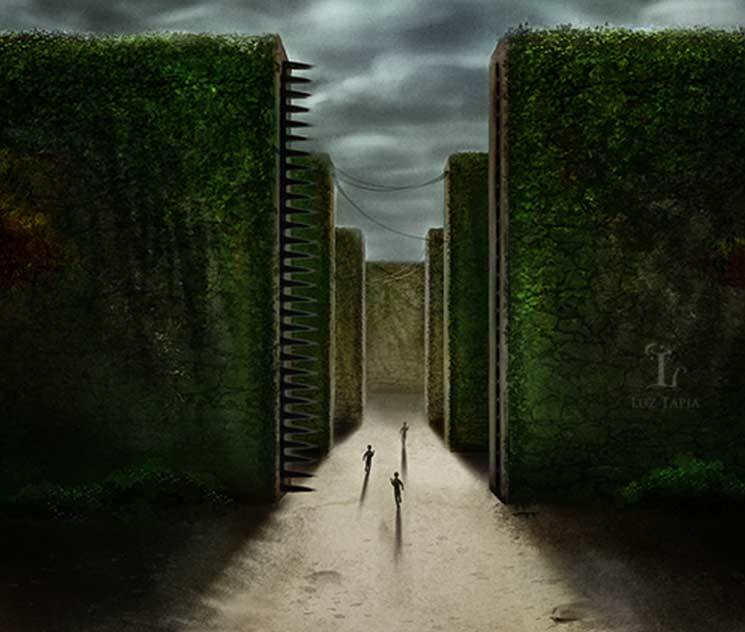 You can continue to walk the maze, venturing this way and that, searching for what you want every step of the way. Or, you can stop and reflect on the maze itself. Where did it come from? Why is it here? What is the purpose of the maze? Why am I here? What is my purpose? In the analogy, the choice is presented as an either-or. Either, you continue on your path or you reflect on the meaning and purpose of it all. But, in life, both can happen simultaneously. Events are thrown hither and thither and demand reflection. For me, one of my reflection moments came two weeks after my return from Iraq. I had returned unscathed but that wasn’t true for my friends who returned after I did. One returned with one less eye, another came home with extra shrapnel, and another with severe burns. Why them and not me? Why was I selected to leave on the advance party? Why was the IED placed after I traveled down that same route just two weeks earlier? Psychologists called it survivors guilt, but it doesn’t need to be this serious to induce the same thoughts. Others experience similar thoughts when loved ones die. Still others face similar thoughts after being laid off from work and wonder about their uncertain future. There are some who struggle similarly when introduced to new concepts and ideas. In fact, there are countless reasons to induce philosophical thought in regards to the formation and purpose of the world. If you’ve never gone through this time of reflection, allow me to challenge you to do so now. Now, in fairness, not every philosophical thought leads to God—nor do I think it needs to. But that’s not the point. The point is simply that philosophical thought exists and it exists daily. I had reconciled the notions of time and chance with coincidence and luck following my near miss of the IED explosion. And that reconciliation went into my worldview backpack. The next time I faced those kinds of thoughts, nearing divorce, I reached into my backpack for “time and chance”; but this time they didn’t fit. This time, I actually had a hand in the fighting and verbal rhetoric. This time, I could change something—my attitude. So I did. My philosophy was changed. Everyone goes through these moments in life that challenge their views on the conception of the world. The fact that individual philosophies change is not the point; the point is every bit of one’s philosophy makes up what we call worldview. Did you catch that. The experiences go into the backpack and is then used to formulate a worldview. And it can stop there. Because a worldview was established at the instant the question was answered. If, as I pointed out at the beginning of this post, worldview has to do with the conception of the world, and God is not a part of the formation, then the conclusion must be in line with atheism. Let me say it another way. If an atheist believes the “Big Bang” was the beginning of the existence of our universe, then the “Big Bang” must be compatible with atheism. In this regard, atheism is the worldview and the “Big Bang” is a mechanism that supports the view. And it doesn’t stop there. Aliens, the multi-verse, a mechanical universe-generator…it doesn’t matter what the mechanism is as long as it is compatible with atheism. Because as soon as the how becomes incompatible with atheism, an atheist will dismiss the possibility in support of his atheistic worldview. The worldview that arises out of wrestling with the notion of God’s existence has the greatest impact. This is where our definitions start plugging into our analogy. When you woke up this morning, you began the day with a series of choices. A lot of those choices seem to have no philosophical impact (i.e., What belt should I wear? or Should I make eggs for breakfast? ), while other choices depend greatly on your philosophy (i.e., Should I lie to avoid getting fired at work?). Every choice hinges on your view of the consequences. Think about that. When I left with the advance party to prepare the home-front, I did so because I believed I was leaving my comrades behind in relative safety. My choice to leave would have been different if I thought I could change their fate. My choice to change my attitude in the face of divorce was because I believed that consequences mattered. They do. I’m still married and we have four amazing children. And this is where we get to the real heart of the matter. Atheism, whether a belief in no god or a non-belief in god, has the same consequential influence on moral decision-making. Those decisions are chosen based on an evaluation that excludes a divine perspective. Atheism, whether a belief in god or a non-belief in god, has the same influence on worldview—it keeps the choices to a local level. And that’s the problem. That’s why atheism is a worldview. Atheist make choices based on the view that God does not exist. If God does not exist, or at very least if you live as if God does not exist, the choices you make will always be made as such. Not just because it defines how you believe the world came into being, but because it affects how you live your life. Do you agree or disagree? Let me know below. Roger Browning is a husband, father of four, Army veteran and has been part of the Clear Lens team since 2016. Roger brings wit, experience and an audacious style to the apologetics genre. Currently, Roger is enrolled in the C. S. Lewis Institute Fellows program and enjoys encouraging others to take their faith seriously. Ep. 141: Ask Nate Anything! I think you’re misinterpreting what is meant by “conception,” in that definition. It’s not talking about the origins of the world. It’s talking about the way which one conceives or thinks about the world. As I’ve said to you many times before, atheism is not a worldview. Atheism is most certainly a component of the worldview which any particular atheist might have, but it is not a worldview unto itself. To treat atheism as if it comprises a single, monolithic worldview is simply wrong. I agree with what you are saying, and probably didn’t cover your point adequately in this post. This post covered the definitions and why I thought it fit. But part 2 (should I ever feel compelled, but not at this point) would address why I don’t think aligning with the definition is the only reason atheism ‘ought’ to be a worldview. I think we ultimately end up at a chicken/egg debate. If, as I believe you will say, the case is that evidence (or lack of evidence) led to the conclusion that no god is believable, then atheism is not a worldview. But, as I believe, if atheism is a belief (in the strictest sense that atheist ‘believe’ themselves to be correct), then that ‘view’ affects the way the evidence is interpreted as it pertains to the ‘world’. Thus, atheism is a worldview. With that, I submit to respectfully–agree to disagree. render us hyperactive agency detectors, promiscuous teleologists, and intuitive dualists; collectively and incidentally, they predispose us to develop religious beliefs– or at least they facilitate the acquisition of such beliefs.” Atheism as a valid epistemology simply acknowledges that religion, theology, superstition and misbelief are by-products of a suite of primitive cognitive mechanisms and therefore applies reason, science and empirical evidence over mythology, mnemohistory, and religious tradition. Hey MCW. Your post got me thinking–I like that. First, a little fun. Then, a serious reply. Cool? 3) (serious) Let’s assume your points are spot-on, irrefutable (they are not, BTW). We end up with more problems than solutions. For starters, we still haven’t addressed causation. Before we can get to atheism ‘from’ religion, we have to get to life ‘from’ non-life. Before we can get to non-life, we have to get to something ‘from’ nothing. Second, if atheism is the greater knowledge which has let go of unnecessary by-product known as theology, then atheism isn’t believable. Seriously! What you just said is that theology was only based on what the chemicals in our brain were capable of making, but the chemicals in our brain are now capable of proving atheism…for how long? In a few hundred years will we ‘know’ something different? Will the evolutionary process lead us back to theology? You are substantiating the untrustworthiness of the brain. Finally, and most seriously, your biggest mistake is assuming Christianity is similar to mythology. But Christianity is far different than any other religion. Ever. We have more evidence for the resurrection of Jesus than we do for Aristotle’s existence. We have more evidence for the prophesy of Jesus’ life than we do for the entirety of the Hittite people. Failing to acknowledge what we know of Jesus is only part of the problem of atheism. Atheism is consistently ‘explaining away’ the unbelievable while simultaneously embracing the impossible because it fits atheism. (ex. Jesus rising from the dead is dismissed as legend in spite of the hundreds of documented witnesses and changed lives while the complexity of human life and DNA are embraced as random mutations of one tiny micro-amoeba that came without any help). And that’s the rub; that’s why atheism is a worldview. Because the evidence is interpreted to fit the belief. 1.) Re: redefining atheism. The point is not in the theist’s attempt to explain atheism anew, but that they do so persistently within the framework of a theistic mindset. e.g. an airplane to a South American pygmy tribe will always be an “iron bird”. It’s humorous and tedious, but it’s not in the attempt to redefine it, only in the tired old clichés, meager reasonings and religious “spin” contrived to do so. It comes of like the childish antics of an eight year-old or psychopath caught in a lie. To wit, your assertion that atheism is a worldview. One might appreciate your painful anecdotal rambling exercise, but it is little more than that a retooled ‘Argument from Morality’ fallacy (See Craig, and vigorously refuted). It’s evident you’re not exactly informed in the matter of evolutionary psychology and the natural history of religion and morality. In fact, your entire argument is based on a Foundational Bias, and this should answer it: If there was a creator god and overwhelming evidence theorized, predicted, detected and repeated it, then yes, atheism could be considered a contrary, if not somewhat dubious worldview. Unfortunately, the opposite is true, and Quantum Theory and The Standard Model of Particles explain that if there was such an omniscient, omnipotent supernatural force working inside and outside of the universe, we would know it. Ergo, Theology is a worldview, and probably a false epistemology, whereas Atheism insomuch as it embraces science, empirical evidence and the multiple disciplines of neuroscience, anthropology, archaeology, mythology, ethnology, and psychology is a true epistemology and scientific methodology. As theology enjoys none of these it is at worst an insidious Iron Age worldview unsupported by modern science. Or, as Joseph Campbell has said in his lectures at the Cooper Union forum: There is no conflict between religion and science, there is only a conflict between the science of 6th Century BCE and the science of the 21st Century. Atheism (whether rejection of a deity or simply believing that there is nothing to believe, it matters not) has to be a worldview, and also a false one. Atheism is based on the principles of Naturalism, which in essence are that everything is random, without any particular cause or purpose, so of course no dependable. This of course includes your thoughts and conclusions. As your thoughts and conclusions are not dependable, relying upon your thoughts to conclude that Atheism is true demonstrates that Atheism is false. If Atheism were true, thoughts and conclusions would not exist. The simplest known cell (a particular bacterium) is more complex than all of Los Angeles combined. The chances of that coming together randomly from pre-existing matter under _any_ circumstances (‘favourable’ can wait) are so low that writing down the odds against it at the rate of one digit per sub-atomic particle would require many times more of such to exist than are included in even the largest hypothesised universe. God's wisdom can be portrayed as foolish but can God's love be portrayed as reckless? Ep. 127: How Do You Talk to a Non-Believer About Abortion? Why Do Christians Believe in the Afterlife? A Clear Lens provides training and materials for Christians to effectively communicate their faith to their friends and neighbors. © Copyright 2016-2018 A Clear Lens, Inc.